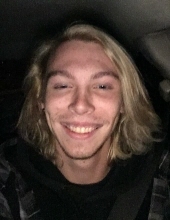 CHESAPEAKE- Dalton Joseph Ward, 20, died March 11, 2019. A native of Chesapeake, he was a member of Real Life Christian Church, 900 Centerville Turnpike, Chesapeake, VA 23320. Dalton achieved Private, First Class of Young Marines in Raleigh, NC. He was a video gamer, avid reader, car enthusiast, who liked math and problem solving, loved being outdoors at peace in nature, preferred dogs over cats, gladly helped with his precious servant heart, and always enjoyed a good conversational debate. He practiced Krav Maga at Savior Martial Arts. He was the Vice-president alongside his dad at the family business. Survivors include his mother, Vanessa Anne Dillender Ward; father, Darin Howard Ward; brothers, Connor James Ward and Aidan John Ward; "plus one" sister, Salem Sierra McKnight; maternal grandparents, John and Janet Dillender; paternal grandparents, Sidney and Linda Ward; paternal grandmother, Pamela Gower and numerous uncles, aunts, and cousins. A funeral service will be held on Wednesday, March 20, at 11 AM in Real Life Christian Church by Pastor Mike Johnson. The family will receive friends at the church following the service. Burial will be in St. Luke’s Cemetery in Smithfield. In lieu of flowers, donations made be made to anthemofhope.org. Sturtevant Funeral Home, Bennetts Creek Chapel, Suffolk, is handling arrangements. To send flowers or a remembrance gift to the family of Dalton Joseph Ward, please visit our Tribute Store. "Email Address" would like to share the life celebration of Dalton Joseph Ward. Click on the "link" to go to share a favorite memory or leave a condolence message for the family.